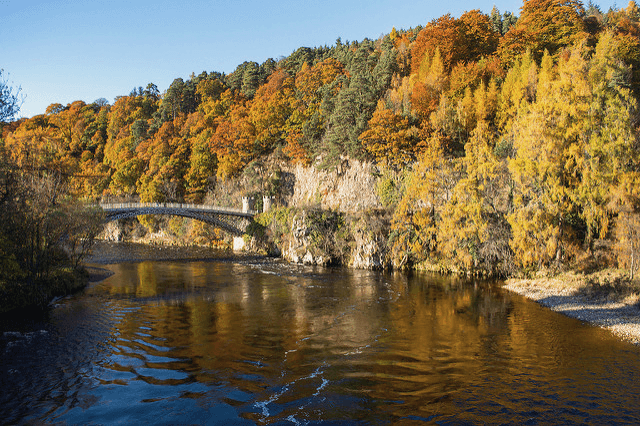 Dalmunach Distillery is directly on the River Spey, in the small town of Carron, about mid-ways in the Central Speyside area below Knockando. Although Dalmunach just opened in 2015, there has been professional production distillation on this site for more than 100 years. You see, this site was the location of the Imperial Distillery which opened in 1897. Imperial was dropped in and out of production several times, as the demand for Whisky used in blends fluctuated over the years. In fact, there was only one official single malt bottling ever in its history -- a 15YO edition, released in the 1990s. But all in all, the distillery never really lived up to the potential of its sweet location. So when Pernod Ricard acquired the site in one of their mega merger deals, they decided to close it down for good in 1998 -- just after its centennial. It sat idle, waiting for another buyer or savior, but in 2013 the corporate powers decided that the value of laction and land -- and the exisitng site license -- exceeded the productive value of the actual facility. So the entire lot was demolished to the ground. They immediately started construction on a brand new distillery on the exact same spot. This is Dalmunach -- named after a swirling pool in the Spey River nearby. Holy mackerel... this new distillery is a state-of-the-art wonder of distilling science and technology. The facility is beautifully designed and modern, yet it preserves the shapes and forms we know and love. And it was built for production baby! The computerized Whisky-Fantasyland is set to produce 10 million liters per year, from its four pear-shaped wash stills, and four onion-shaped spirits stills, running all day, every day. Your grandchildren will someday tour it's halls and stills. The cost of demolishing the old buildings and constructing them anew was $25 million. Craig: There was an old distillery here, the Imperial, which was mothballed in 1998. But instead of reviving and restoring that one, the owners, Chivas Brothers, decided to knock it down and start from scratch. And what they've created for their £25 million investment is one of the most innovative and technologically advanced malt plants anywhere in the world. It's 20% more energy efficient than most other Whisky distilleries and it will produce 10 million liters of spirit every year. Their investment, according to the company, is a sign that they're confident that sales of Scotch around the world will continue to grow. Laurent: Consumers are still very keen to, let's say, to get access to international brands. This [inaudible 00:00:46] is very, very strong and we're confident it will last. I wouldn't say that it will be always an easy road. It could be a little bit sometimes of a bumpy road, but we are confident with the direction, yeah. Craig: With the First Minister doing the honors and officially Dalmunach here today, the owners say that they are creating enough supply to meet expected global demand into the future. Now, everything here may be shiny and new, but the stillmen have guaranteed that the Whisky produced here will still taste like a traditional Speyside malt. Craig Anderson reporting, Scotland at the Dalmunach Distillery.